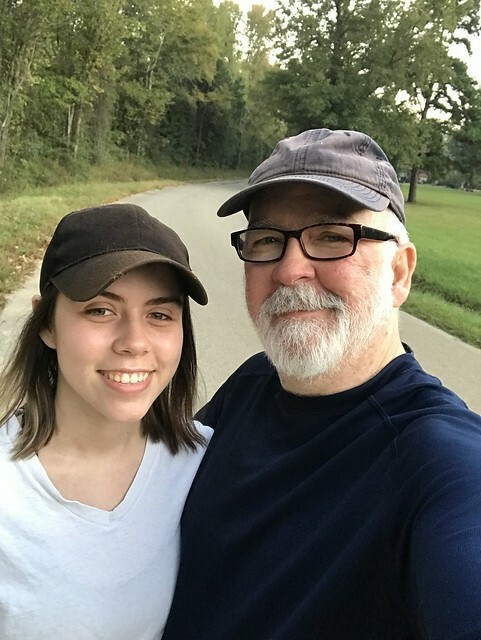 My daughter and I decided we were going to do a local 5K run, but couldn't afford the $60 entry fee. (It never occurred to me that people paid money to be miserable), so instead, we decided to run around the block. This is us before we headed out on the Inaugural "Grab A Friend And Run Around The Block 5K This Is Fun? Run." We didn't take an "after" photo, of course, but I fixed pancakes. That was the "fun" part, I assume. Join us next year, the 2nd Saturday in October, rain or shine. Post photos somewhere. Eat pancakes. Moan for the rest of the day.